The two short videos below, show cooking on early cast iron cook stoves, bringing to life these 19th century images. 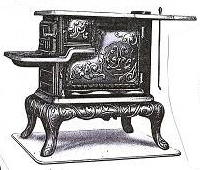 The first stove has an upper or step-up oven, while the second is a box stove with oven. The cook stove in the Jones Farm Kitchen at the Genesee Country Village Museum in NY can be seen in use in a very short Youtube video HERE labeled "1850s farm kitchen cook stove." The fire is in the front under the pots and the oven is higher in the rear with a flue pipe coming out of the top. In the video, a tin kitchen with meat on a spit is placed on the shelf in front of the fire. Thus the stove could heat the room, bake, boil, fry and roast. The oven in the second stove is behind the fire box. Another short video HERE entitled "Cooking on a cast iron stove" shows baking and frying with this stove.